Copyright notice: The texts, photos, images and musical scores on all pages of this site are covered by UK Law and International Law. All rights of publication or reproduction of this material in any form, including Web page use, are reserved. Their use without our explicit permission is illegal. 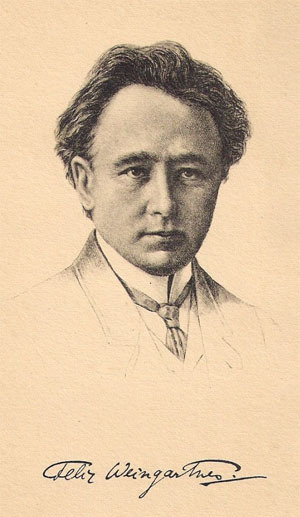 Among champions of Berlioz in the late nineteenth and early twentieth centuries Felix Weingartner holds a significant place, both as conductor of his music and co-editor (together with Charles Malherbe) of the first attempt at a complete edition of the composer’s musical works, which appeared between 1900 and 1907 to coincide with the centenary in 1903 of Berlioz’s birth. The exact part he played in the promotion of Berlioz will be examined in greater detail in this page. In addition to his work for Berlioz, Weingartner was also an important figure in his own right in the history of music in his time. A versatile, talented and cultured figure, with a wide range of interests beyond music, Weingartner invites comparison with Berlioz himself. More than most of his contemporaries, whether in Germany or elsewhere in Europe, he was at once a composer, a conductor, and a writer, chiefly on musical but also on other subjects, and was tirelessly prolific in all these fields. His long career spanned the latter part of the nineteenth and first part of the twentieth centuries; he lived through the first World War and was deeply affected by it, witnessed the Russian revolution and visited Soviet Russia, and died in Switzerland early in the Second World War. He gave concerts in virtually every country in Europe, made several trips to both North and South America, and visited Japan in 1937 and Palestine in 1940. He knew and met Liszt, Wagner, Brahms and many other leading figures of the musical world of his time, and lived long enough to witness and benefit from technological developments which profoundly influenced the history of music, notably the advent of recording and broadcasting. He was the first conductor to record a complete cycle of Beethoven’s symphonies (and also those of Brahms), and was the first to make a recording of Berlioz’s Symphonie fantastique. Longevity turned him into a historical figure in his lifetime: when he conducted a performance of Parsifal at Covent Garden in May 1939 near the end of his career, it was observed that he was one of the few musicians still alive who had witnessed the first performances of Wagner’s opera at Bayreuth in 1882. This page will concentrate on Weingartner’s relations with Berlioz’s music; it cannot give more than a general view of his career and achievements as a whole, though on the other hand it is necessary to take his career into account to place his work for Berlioz in a wider context. Because of the abundance of material available it has been necessary to divide the presentation into several pages. This page, the principal one, also available in French, includes a discussion of the available source material, including Weingartner’s own autobiography Lebens Erinnerungen, an outline of his career, a discussion of Weingartner and Berlioz, a chronology of the main events in Weingartner’s life (which includes references to all the concerts specifically mentioned in these pages), excerpts in translation from Weingartner’s autobiographical writings, and a selection of illustrations. Subsidiary pages include English and French translations from the original German of articles Weingartner wrote on Berlioz and reproduced in Akkorde, a volume of essays published in 1912, and excerpts (in French only) from the musical journal Le Ménestrel which span a very large part of the career of Weingartner from 1891 to 1940 (with a gap in the years 1915-1918 during the First World War). All translations are © Michel Austin. A comprehensive study of Weingartner’s life and work has yet to be published; there is to date no equivalent to, for example, studies of Weingartner’s contemporaries Hans von Bülow (such as those by Alan Walker in 2010 and Kenneth Birkin in 2011) or Felix Mottl (by Frithjof Haas in 2006). Undertaking such a study would be a daunting task, given the considerable volume of material potentially available: Weingartner’s own copious writings — articles and books on musical and other subjects, autobiographical works, his correspondence — much of which has yet to be collected and published as a whole; the evidence of journals and newspapers of the time from all the countries in which he gave concerts and operatic performances; extant concert programmes for all of these; surviving archives of concert societies and opera houses; the recollections and testimony of contemporaries, and more besides. This page is based on a selection of the material available to us, which represents necessarily only a very small part of what potentially exists, and therefore leaves many gaps in detail which may be filled in due course. This evidence falls into two broad categories: contemporary documentary material, and Weingartner’s own published writings. The first category comprises portraits and illustrations of Weingartner, Weingartner’s own recordings, concert programmes, and excerpts from the journal Le Ménestrel mentioned above. 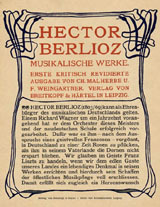 The second comprises the articles Weingartner wrote on Berlioz which have also been mentioned above, books or pamphlets he wrote on musical subjects of direct or indirect relevance to Berlioz, notably the essays On Conducting (first published in German in 1895, subsequently revised and reissued in several editions, the last of which dates from 1920); On the Performance of Beethoven’s Symphonies (first published in German in 1906, which also went through several editions, the last of which dates from 1928); and The Symphony since Beethoven (first published in German in 1897, subsequently revised several times, the last edition dating from 1926). All three works are conveniently available in English translations of their latest editions in a single book under the title Weingartner on Music & Conducting (London and New York, 1969). But the most important source for Weingartner’s life and personality is provided by Weingartner’s own autobiographical writings. It is not clear at what point Weingartner started writing his Lebens Erinnerungen (Memoirs). The collection of articles he published in 1912 under the title Akkorde includes already some autobiographical chapters, notably on his early years in Graz from 1869 to 1881, his meetings with Liszt between 1882 and 1886, visits to London in 1898, to Grenoble and La Côte-Saint-André in 1903, and to Paris in 1905. 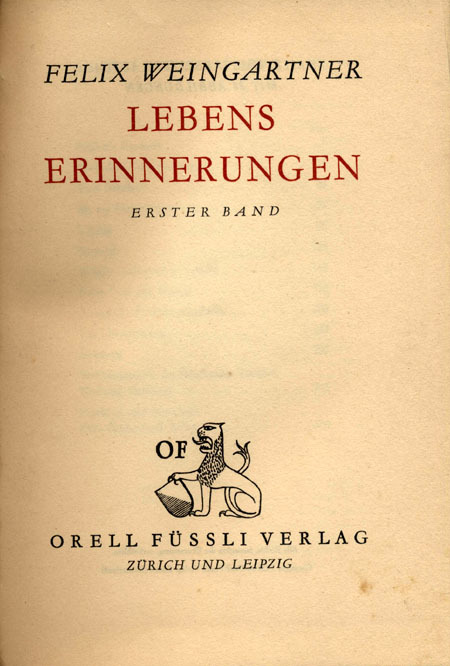 The Lebens Erinnerungen were first serialised in a Viennese journal from 1919 to 1921, then issued in a revised and updated version in two volumes published in Switzerland in 1928 and 1929. 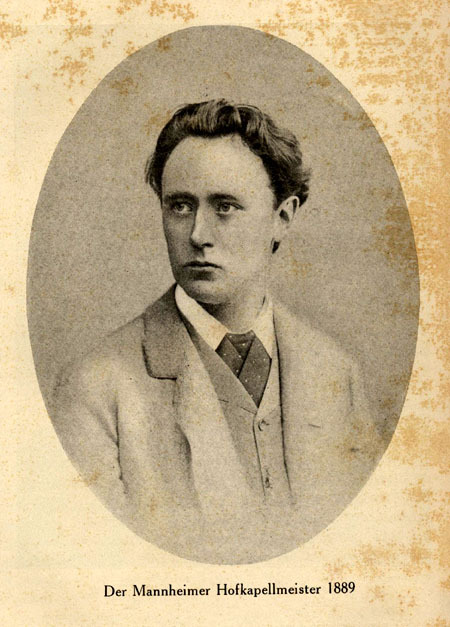 Volume I covers his early life up to his appointment at the Berlin Royal Opera in April 1891, which in his view marked the start of his adult career (he was 28 at the time). Volume II covers the period thereafter down to May 1927 when he settled in Basel in Switzerland to take up a new post as conductor of the Basel Symphony Orchestra and director of the Basel Conservatoire. The time after this was covered in a third volume, which exists only in manuscript or typescript form and has yet to be published, more than 75 years after Weingartner’s death. The account in volume I is very detailed and largely chronological in presentation, and easier to follow. Volume II is somewhat different in character; though still chronological, it is more discursive; dates and the exact sequence of events are sometimes unclear, and the coverage is uneven; some events are dealt with fully, others less so, or even completely omitted. Weingartner’s Lebens Erinnerungen invite comparison with Berlioz’s own Mémoires, but the comparison is not to the advantage of the former. The differences between the two men, their personality and outlook, and their versions of their own lives, are very obvious. Berlioz’s account, concise, selective and varied, deliberately omits a great deal; it is written with the reader in mind and is a work of art — hence its enduring popularity, and the numerous translations in various languages. The same could hardly be said of Weingartner: conciseness is not one of his strong points. The work does contain a great deal of interesting information, about Weingartner himself, his career, the musical world he moved in, the many personalities he met, his wide-ranging travels, and the history of his time. But the reader feels at times overwhelmed with a mass of detail of varying importance. Taken together the two volumes add up to no less than 825 pages, and according to Weingartner the 2nd edition of the work was shorter than the original version by about one quarter. Unlike Berlioz, Weingartner does not try to present his material in a manner that is helpful to the reader. The title of many chapters, which are not numbered sequentially for ease of reference, do not usually give a clear indication of their contents or of the period of time they cover. The chapters do not have any subtitles, and there are no subheadings within the chapters. It is perhaps not surprising that as yet there does not seem to be any complete translation of the original German text in any language. Unlike Berlioz, Weingartner does not state at the outset what was his purpose in writing. The work does not have a proper explanatory preface. It is only much later that Weingartner refers casually to the writing of his memoirs and cites approvingly the belief of Goethe, one of the constant idols of his life, that those who had achieved something in their career should write their autobiography for the benefit of posterity (LE II p. 313). Nor does Weingartner explain what method he followed in gathering and presenting his material. He certainly was gifted with a remarkable memory for events, people and places. He could remember vividly his experiences from an early age (from around the age of 4 onwards). It is not clear whether he kept a diary regularly. The only explicit mention of a diary comes from his first trip to South America in 1920, when he reproduces in abridged form his diary for the trip day by day, from the departure from Vienna on 14 June, his journey via Rome and Genoa, his sailing to Rio de Janeiro, then his stay in South America, until his final return to Vienna on 10 November of the same year (LE II pp. 260-91). His second journey to South America two years later, in 1922, does not get the same treatment and is more briefly handled, without any clear indication of chronology (LE II pp. 355-66). One of the striking features of Weingartner’s Lebens Erinnerungen is how much Weingartner dwells on himself and his inner life. He comes across as self-absorbed and introspective; because he reveals so much about himself, his own personality figures prominently in any discussion of him, more so perhaps than with any other comparable musical figure. His many portraits give a consistent impression of a serious, intense and even sombre figure, an impression confirmed by the general tone of his Memoirs. He set himself and others high standards, and had a keen sense of his own worth. He was sensitive and impressionable, but at the same time anxious to assert his independence. He was quick to take offence and liable to act on impulse, and was altogether not an easy person to deal with (unlike, for example, his contemporary the affable and good-natured Felix Mottl). His career is punctuated with disputes, especially with managers and administrators of opera houses and impresarios, with whom he had to deal throughout his career, disputes sometimes lasting for years, which were frequently seized upon by the press and became the subject of public gossip. The excerpts from Le Ménestrel collected on a separate page give numerous illustrations of this (see for example under 1893, 1896, 1898, 1910). He found it easy to make enemies and would remember grudges, though he also had devoted friends who appreciated his considerable talents and to these he remained loyal. His Memoirs often read like an extended catalogue of litanies, and the prevailing impression is of life as a struggle against adversity. He recalls at one point his delight in learning ancient Greek at school, but regrets having forgotten it all and not being able to learn it afresh. ‘If the life we live’, he writes, ‘was real life and not a perpetual, strenuous and breathless struggle to overcome physical and mental obstacles, then I would undertake this very day to start again declining the word anthropos [man]’ (LE I, p. 69). The explanation for this complex and sometimes difficult personality is perhaps to be sought in part in the experiences of his early years, about which Weingartner is frank and revealing. He lost his father before the age of six (LE I, pp. 4-5, 8-9), and later in life looked for idols and role models, such as Goethe among figures of the past, or among contemporaries Franz Liszt to whom he became devoted. He was a single child; an elder brother died at the age of two before Weingartner himself was born, yet was held up to him by his mother as an example; he resented this and it was the starting point of his ambivalent relationship with her (LE I, pp. 17-18; II, p. 327). His widowed mother lavished her care on him and looked after his early education, but at the same time she was protective to the point of possessiveness. She started off and fostered his musical education (she gave him his first piano lessons; LE I, pp. 7, 22-3, 27, 42), but also opposed his ambition to pursue a musical career (LE I, pp. 31, 73, 80). Their tastes and outlook differed in many ways. Their relations went through many ups and downs, and it took a very long time for both to be finally reconciled (LE II, p. 250). Later in life Weingartner had on his own admission difficulty in his dealings with women, which he traces back to the influence of his mother (LE II, pp. 10-12). It is perhaps no accident that he married no less than five times and divorced three of his wives (on this see below in relation to Lucille Marcel, his third wife, and Roxo Betty Calisch, his fourth wife). Another feature of Weingartner’s personality which strikes the reader is his lifelong preoccupation with the ‘other world’ and his belief in the influence it exercised on human affairs. His very first memory was that of the image of a star painted on the ceiling of his bedroom in Zara (LE I, p. 1) and from an early age he developed a keen interest in studying the sky at night, about which he became very knowledgeable (LE I, p. 50; II, pp. 276, 297). His mother was a devout catholic who insisted on giving him a strict religious education, which he resisted (LE I, p. 18). Weingartner subsequently went through moments of intense religiosity (LE I, pp. 50, in 1875; 69, in 1878), but eventually outgrew his attachment to a single exclusive confession, and this brought him into conflict with his mother (LE I, pp. 104-5). He was convinced of the power of outside forces on human life and the possibility of foretelling the future. He relates his consultation in Berlin in 1885 of a woman skilled in palmistry, who, according to him, was able to recall accurately events of his earlier life, including his birth at Zara (modern Zadar) on the Adriatic Sea, forecast correctly steps in his future career (his subsequent appoints in Danzig in 1885, Hamburg in 1887, and Berlin in 1891), and outlined his past and future relations with Franz Liszt (LE I, pp. 231-2). Later Weingartner developed an increasing interest in the occult and astrology, which he studied in depth and regarded as a science, and became ever more convinced of the reality of secret powers that influenced the world (LE II, pp. 322-6). During a trip to Romania in 1920 he became acquainted with the writings and teachings of Bô Yin Râ — the pseudonym of the German painter and writer Josef Anton Schneiderfranken (1876-1943), whom he eventually met and was impressed by. He cites approvingly a saying of his: ‘If you want to seek, seek in yourself, you will find everything there that you are looking for, provided you know how to seek’ (LE II, pp. 329-30). During his second trip to South America in 1922 he even wrote and published a book about him (LE II, pp. 347-8, 358-9). The penultimate chapter of his Memoirs, covering the years 1923-1926, is entitled ‘The Dark Hand’ (Die dunkle Hand) — the secret power that Weingartner believed was exercising a malign influence on his life. Towards the end of that chapter he addresses defiantly ‘The Dark Hand’ as though it was a living being: for all its malevolence it has not prevented him from achieving what he has (LE II, p. 429). By this point the reader will have realised that on this particular subject Berlioz and Weingartner had very little in common. Berlioz had no time for introspection and self-questioning, nor for metaphysical speculation. It should also be added that the vast majority of concert-goers who attended and admired Weingartner’s performances were probably completely unaware of his mystical beliefs, and only saw him as the great conductor and musician that he was. Berlioz and Weingartner did share a common experience in another way: both of them became convinced when still young that music was their natural element, that they wanted to devote their lives to music, and specifically to composition. In pursuing this aim both had to face parental opposition, Weingartner from his mother, Berlioz from his whole family. But they diverged in the musical education they received in their early years. Before he arrived in Paris late in 1821 at the age of 18, Berlioz had received little in the way of a serious musical education; he knew very little about instruments, virtually nothing about harmony and counterpoint, had never heard a symphony orchestra or attended an operatic performance. He did admire Gluck and Haydn, but only in his imagination: for him they were merely the names of great composers he had read about in an encyclopaedia. Hence the revelation and shock for him when he arrived in Paris and was able to see and hear for the first time large-scale operas performed on stage at the Paris Opéra, with famous singers and a large and professional orchestra. Weingartner by contrast grew up almost from the start in an environment in which classical music was taken for granted as a normal part of life, at home and in the theatre. In the early chapters of his Memoirs he gives abundant and remarkably precise detail about the main stages in his musical education; only a few examples can be mentioned here. He was fascinated by the violin already around the age of 3, and when aged 4 his mother started to give him piano lessons (LE I, pp. 6-7). The death of his father (24 April 1868) forced the family to leave Zara and move to Graz in Austria. The move was initially traumatic for both mother and son, and interrupted his piano lessons, but in the long run it opened up wider musical opportunities than were available in Zara. Soon after the move he first heard of the name of Beethoven through a grandmother who had seen him in Vienna (LE I, p. 14). In the autumn of 1869 his mother resumed his piano lessons, started teaching him musical notation and introduced him to Schubert’s songs (LE I, pp. 22-3). Young Felix quickly developed a fascination for opera and the theatre and was overwhelmed by a performance of Don Giovanni around early 1871, which reinforced his conviction that he wanted to be a musician (LE I, pp. 28-31). He developed perfect pitch even before the age of 10, and his mother, convinced of his talent, decided to entrust his musical education to a professional musician and composer, Dr. Wilhelm Mayer (known under the pseudonym of W. A. Rémy; LE I, pp. 35-6). Mayer proved to be an excellent teacher, under whom Felix made rapid progress, and to whom he remained devoted (LE I, pp. 45-6). Opportunities to hear musical performances multiplied, and through piano arrangements for four hands of orchestral music he was able to enlarge his knowledge rapidly. In winter 1876-7 he started lessons in composition and heard Beethoven’s fourth symphony at his first orchestral concert (LE I, pp. 54-55). He published his first composition aged 16 (a set of piano pieces; LE I, p. 74), and by the time he finished school and received his leaving certificate on 15 July 1881, aged 18, he already had 3 published opus numbers to his credit (LE I, p. 80). At the Konservatorium in Leipzig he studied conducting and started to gain practical experience of directing an orchestra (LE I, pp. 89, 97-9, 124-5, 143-4). Weingartner’s musical education was grounded on the great German classics, from Bach through Hadyn, Mozart, Beethoven, and Schubert to Weber. The living composers whom he came to meet and idolise were also German. The first of these, and a very powerful influence on him in his early years, was Wagner. He first heard of Wagner in 1874, when aged 11 (LE I, pp. 42-3). In the summer of 1876 he was informed of the opening of the Bayreuth festival, and started to listen to Wagner’s music, despite his teacher’s reservations (LE I, p. 53). Initially he admired only the early operas of Wagner, but a hearing of Meistersinger turned him into an ardent Wagnerian (LE I, pp. 70-1). In September 1881, on arriving at Leipzig to study at the Konservatorium, his very first visit was to the house where Wagner was born; soon he was able to borrow and study full scores of Wagner (LE I, pp. 86, 93-4). Weingartner’s first opera Sakuntala was on his own admission heavily influenced by Wagner (LE I, pp. 100-1, 146). A decisive moment was his visit to Bayreuth in the summer of 1882 to attend the first performances of Parsifal, and he was even able to meet the old master and talk to him, an experience he never forgot (a whole chapter is devoted to that visit, LE I, pp. 128-41, 142). The death of Wagner the following year (13 February 1883) affected him deeply (LE I, pp. 150-5). He returned to Bayreuth in the summer of 1884 to hear Parsifal again (LE I, pp. 198-9), then once more for the festival in the summer of 1886 (LE I, pp. 260-77): this gave him a chance to get closer to the Wagner family, but it was also during this visit that Liszt, also present in Bayreuth, died on 30 July 1886. To Weingartner this was a grievous blow in itself, but he was also shocked by the detached way in which the Wagner family reacted to the event. This was a turning point. He had never been part of the inner circle of Wagner conductors (Hans Richter, Hermann Levi, Felix Mottl) and came too late to join them: over his entire career he never conducted any performances at Bayreuth (LE I, pp. 84-5). But he now distanced himself from the Wagner family, especially Cosima, the daughter of Liszt and widow of Wagner, and moved away from the Bayreuth orthodoxy. In 1898 he published a critical pamphlet on Bayreuth (LE II, pp. 72-3; Ménestrel 23/1/1898). He argued against the monopoly claimed by Bayreuth over the performance of Parsifal (LE II, pp. 134-5; Ménestrel 31/8/1902, though cf. 22/5/1909), and defended the practice of making cuts in some of Wagner’s operas, for practical reasons (LE I, p. 112; Ménestrel 27/6 and 11/7/1908). But to the end of his career he never ceased to admire and perform the music of Wagner and he probably conducted more performances of Wagner’s operas than of any other composer. Weingartner’s acquaintance with the music of Liszt started later, and although he did not rank Liszt as a composer as highly as Wagner, he remained devoted to him personally, as well as including his orchestral works in his concerts. Their first meeting came in June 1882 when Liszt invited him to visit Weimar, and received him kindly (LE I, pp. 118-24). He met him again in Bayreuth in the summer of 1882 (LE I, pp. 137-8), and the following year came to stay in Weimar for a more extended period in the autumn, then again during the winter of 1883-4 (LE I, pp. 161-8, 175-97). It was during this time that they became close: Liszt extended to Weingartner his full support, and agreed to have Weingartner’s first opera Sakuntala performed in Weimar in early 1884. Further contacts followed, in Weimar in March 1885 (LE I, pp. 219-27), then in Karlsruhe in May 1885 when Liszt had the opportunity to share with Weingartner his memories of Berlioz (LE I, pp. 232-5). The death of Liszt in Bayreuth on 30 July 1886 affected him deeply: coming after the death of Wagner 3 years earlier, Weingartner felt that this marked the end of an epoch (LE I, pp. 273-6). Weingartner’s bond with Liszt was both personal and musical: the celebrated and venerable figure had extended his support to a struggling young man, and Weingartner came to discover the orchestral works of Liszt which he felt were unjustly neglected (LE I, pp. 228-9). In his Memoirs he proudly reproduces a photo of the full score of the Faust symphony which Liszt presented to him, with a hand-written dedication dated January 1884 in Weimar (LE I, plate facing p. 113). In his Akkorde he included two essays on Liszt (pp. 42-57: reminiscences about Liszt; pp. 57-64: on conducting Liszt’s music). In his concerts he regularly included works by Liszt (see for example the concert in Turin on 21 May 1905; that in Athens on 12 May 1925; Ménestrel 19/2/1899; 15/2/1903; 20/11/1904; 30/3/1928; 9/2/1940). Brahms was a late-comer to the circle of Weingartner’s idols: this is a reflection of Weingartner’s initial infatuation with the music of Wagner. The consequence of this was an instinctive suspicion for a composer who was on the opposite side in the controversy which divided German musicians at the time into two rival camps of admirers of Wagner and of Brahms (LE I, pp. 113-14, in 1882). He heard Brahms conduct his third symphony in Leipzig in 1884 and at first hearing did not make much of it (LE I, pp. 186-7). In the meantime Weingartner’s attitude to Wagner, or at least to Bayreuth and the Wagner family, was evolving and this helped him to become more receptive to the music of Brahms. In 1888 he heard Brahms conduct his Academic Festival Overture and fourth symphony and started to take notice (LE I, pp. 311-12). The decisive breakthrough came in spring 1896 in relation to a concert he gave in Vienna with the Berlin Philharmonic, at which he performed the second symphony, which he had liked from an early date. Before and after the concert he was able to meet Brahms; Brahms expressed approval of Weingartner’s conducting of his symphony, which, Weingartner says, became henceforward a staple item in his concerts. Brahms wrote to him a warm letter of appreciation, a facsimile of which Weingartner proudly reproduced in his Memoirs. As he records, he spent in all only a few hours with Brahms, but the memory of that meeting he would never forget (LE II, pp. 62-70, cited in part below). Brahms’ music figured regularly thereafter in his concert programmes, and Weingartner’s authority as a Brahms interpreter was widely acknowledged (see for example Ménestrel 29/5 and 13/11/1931; 15/3/1935; 19/3/1937; 9/2/1940). Weingartner is remembered primarily as a conductor, through the performances he gave in his lifetime and the records he made. This would have come as a disappointment to him: his real ambition from his early years was to be a composer (LE I, p. 73). He turned to conducting not for its own sake, though in the event he excelled in his profession, but in order to make a living, and also to be able to conduct his own compositions (LE I, pp. 98-9). The same was true of many German Kapellmeister at the time, who were both conductors and composers (as had been the case with Berlioz before): among Weingartner’s contemporaries Gustav Mahler and Richard Strauss are two prominent examples. But it annoyed Weingartner that he was thought of as primarily a conductor who also happened to be a composer, and what was worse, that his compositions were often unfavourably contrasted with his conducting (LE II, pp. 31, 138, 430; cf. Ménestrel 10/5/1896). Repeatedly he toyed with the idea of being able to earn enough to give up conducting altogether and devote himself to composition, though this never happened (LE II, pp. 105, 146, 429). It should be added that it is as an orchestral conductor that Weingartner is chiefly remembered, again, through his concerts and recordings, and it is the case that in the last two decades of his career he was heard more often in the concert hall than at the opera. He was generally more at ease with orchestras than as conductor in a theatre where he was often not free to act as he wished. But in practice Weingartner thought of himself as in the first instance a man of the theatre (LE I, pp. 31-2; II, p. 77). He frequented the theatre and opera from an early date (1871), years before he heard his first orchestral concert (in 1876; LE I, p. 55). All his early appointments, from Königsberg in 1884 to Berlin in 1891, were as conductor of an opera house, and this remained true of many subsequent appointments (the Vienna Opera in 1908 in succession to Mahler; Boston in 1911, Darmstadt in 1914, the Vienna Volksoper in 1919, his two visits to South America in 1920 and 1922, Barcelona in 1924 and 1925, Vienna again in 1935). His first series of orchestral concerts only started in 1889 during his appointment in Mannheim (LE I, pp. 349-50). As a composer, once he had progressed beyond piano pieces to more complex music, he turned first to writing operas: he had already written and staged three operas before he wrote any symphonic music (the symphonic poem König Lear dates from 1895, and his first symphony from 1898). In his Memoirs he writes at greater length about his operas than his other music. Despite a very busy and wide-ranging career as conductor, he was a prolific composer, the author of no less than nine operas, seven symphonies and several other orchestral works including a violin concerto, five string quartets, a quintet, a sextet, an octet, and numerous songs and piano pieces. Weingartner’s long career spanned nearly sixty years, from his first appointment at Königsberg in 1884 to his last performances not long before his death in 1942. This career was eventful and varied, with a long succession of appointments and commitments over virtually the whole of Europe and north and south America, and even the Middle East and the Far East. It would be fastidious to relate it in detail, and a summary of main dates is provided in the chronological section below which includes references to his own writings, to images and to translations of selections from his autobiographical writings both found on this page, and to excerpts from the Paris weekly Le Ménestrel found on a separate page. (1) From 1884 to 1897, when his activity was entirely within Germany and the German-speaking world. He held in quick succession a series of appointments at opera houses (Königsberg, Danzig, Hamburg, Mannheim, Berlin), where he gained experience as a conductor, developed his reputation and was in increasing demand. It was at the same time a period of frequent conflicts with the managers, producers and administrators of opera houses, which was to prove a recurring problem through much of his career, especially with his appointments in the most prestigious opera houses of the time, Berlin in 1891, later Vienna in 1908 (and again briefly in 1935), where initial hopes turned sour and ushered in some of the most difficult periods of his career. But in addition to his work in the opera houses Weingartner started to develop a parallel and this time very successful career as orchestral conductor, first in Mannheim in 1889, then in Berlin in 1891 which lasted till 1907 (he gave up the post of the Berlin Opera in 1898). 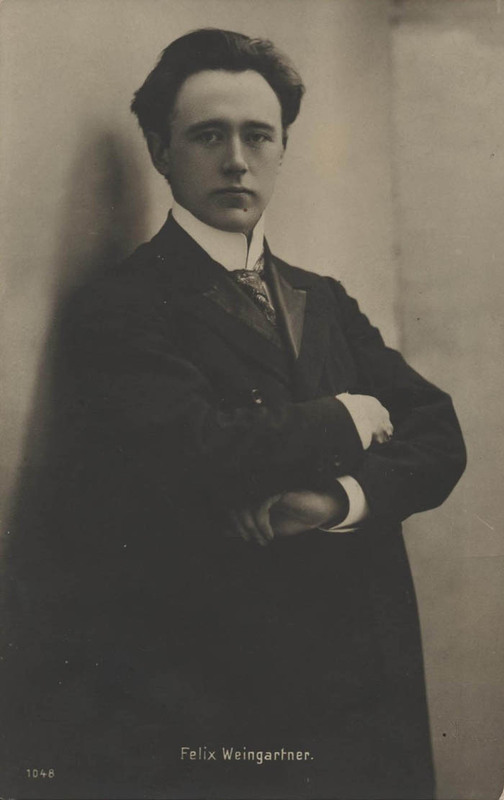 Later in Vienna in 1909 he was appointed by unanimous acclamation conductor of the Vienna Philharmonic, with which he developed a strong and lasting relationship which endured till 1927, whereas his relationship with the Vienna Opera terminated prematurely in 1911. (2) From 1898 till 1914 (the outbreak of the First World War). This marked the start of his international career, during which he never ceased to be in demand all over the musical world of the time. His first visits to Paris and London in 1898 were very successful from the musical point of view: he regularly returned there in the following years (including visits to Scotland and other parts of England in 1907). But he was also entranced by the two capital cities on which he dwells at length (LE II, pp. 90-3 for Paris, pp. 96-7 for London). He visited Russia in 1899, then again in 1910 and in the following years, the United States in 1904, 1911 and 1913, Italy, for which he had a special fondness, in 1905 and frequently thereafter. All those visits gave him opportunities to further his artistic and aethestic interests; he was an avid visitor of museums and a keen sightseer wherever he went. He had a strong interest in the visual arts: his 1897 symphonic poem Das Gefilde der Seligen (The Elysian Fields) was inspired by a painting by Arnold Böcklin (LE II, p. 82). His travels also enabled him to develop his language skills (his mother had started to teach him English, though with little success — LE I, pp. 34-5). As his career progressed he became able to converse in at least three languages in addition to his native German: English, French and Italian. It is noticeable that direct quotations in these languages become increasingly frequent in the later chapters of the second volume of his Memoirs. (3) The First World War 1914-1918. For Weingartner, as for so many others, this was a traumatic event which affected him deeply. It reinforced the hatred of war which he had felt almost from his earliest years, and his aversion for politicians who were responsible for causing wars (LE I, pp. 3, 56, 149-50; II, pp. 114, 324-5). The war inevitably circumscribed completely his international musical activities, as travel outside the German-speaking world was now impossible for the duration of the war. But at least he was fortunate to be able to spend the earlier years of the war down to 1917 in neutral Switzerland, until, later in the year, unable to sustain the cost of living in that country, he moved back to Vienna. But the war also had unfortunate personal consequences. After the outbreak of war in 1914 he was persuaded to add his signature to a manifesto of 93 German intellectuals protesting against French behaviour. The manifesto caused predictable outrage among the countries allied against Germany, especially in France. Eventually in 1917 Weingartner disavowed the manifesto and turned his fire against the political leadership in Germany which he held responsible for the disaster (LE II, pp. 120-1, 241-3, 257-8, 352-4). But the damage had been done. In France, at least, the manifesto was long remembered and cited (Ménestrel 23/1/1920; 20/7/1920; 16/1/1931; 13/3/1931; 5/1/1940). 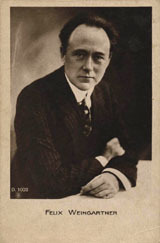 As a result Weingartner, who had been a regular visitor to Paris from 1898 to 1914, found himself unable to return for many years: it was only in 1931 that he was able once more to give concerts there, and the first planned visit had to be cancelled through fear of hostile demonstrations. But in Germany his volte-face towards the end of the war caused him to be decried as a traitor by elements in the Berlin press that had long been hostile to him, and it took some years for the controversy to quieten down (LE II, pp. 353-4; Ménestrel 23/1/1920; 5/11/1920; 17/3/1922). In general the traumas of the war intensified his strong sense of German cultural identity and his devotion to it. Weingartner grew up in Austria and did his schooling in Graz. But very soon he felt the need to identify with Germany and German culture (LE I, pp. 64-6, 83-4). When he moved to Leipzig in autumn 1881 be became very conscious of his own Austrian accent and endeavoured to eliminate it (LE I, p. 147), and remained thereafter sensitive to any hint of Austrian accent on the part of others, such as Felix Mottl (LE I, p. 363; Felix Mottl was born in Vienna, but unlike Weingartner continued to think of himself as an Austrian rather than a German). In his first visit to Paris in 1898 Weingartner commented approvingly on Madame Chevillard’s good knowledge of German and appreciation of German culture (LE II, pp. 90-1). The outbreak of the first World War made him even more sensitive to attacks on it, and grateful for expressions of admiration for German art in spite of the war. After the war he felt even more strongly that it was his task to promote German art and culture, and to defend them against unjust attacks that were politically motivated. There are numerous illustrations of this during his first tour of South America in 1920 (LE II, pp. 293, 297-9, 308, 320), and for his second trip tour in 1922 he insisted on performing German operas there in German (LE II, p. 349). He did the same in Barcelona in 1924 (LE II, pp. 390-2, 399-400). (4) From 1919 to his death in 1942. Weingartner was gradually able to resume his international career. 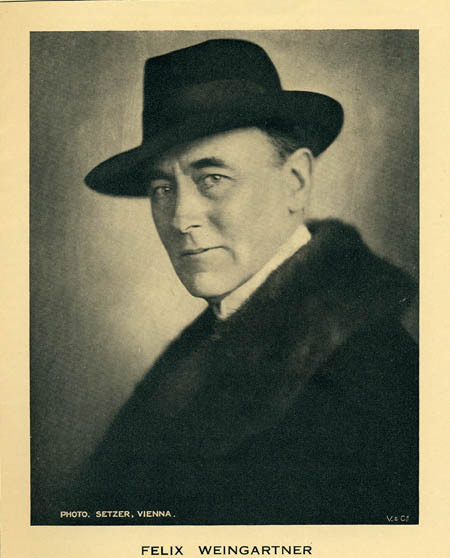 In 1919 he was appointed director of the Vienna Volksoper, a post he held until 1924. In 1920 he made a visit to Romania where he was well received, and this was the first of frequent visits to that country. The visit to Romania was followed by one to Italy, a country he had long been attached to, and that visit itself brought about his first and very successful trip to South America (Brazil, Argentina and Uruguay), for which he kept a detailed daily journal which was later included in his Memoirs. Two years later (in 1922) he revisited South America, this time taking the Vienna Philharmonic with him for part of his stay. In 1923 he returned to London for the first time since before the war, where he was again very well received and signed a long-term recording contract with the Columbia Recording Company. He returned to England frequently thereafter, for the last time as late as March 1940. He also made visits to Scotland in 1924 and 1925, in the course of which he was introduced to the institution of school concerts, a practice which he sought to bring to Switzerland (LE II, p. 398). He gave a series of operatic performances and concerts in Barcelona in 1924 and 1925, though the second visit went badly wrong, apparently because of hostility on the part of members of the orchestra. But this was followed in the same year 1925 by a very satisfying visit to Greece in May and June, during which he was able to renew his love for ancient Greece and its monuments, a love he had first experienced many years earlier during a visit to Sicily in winter 1897-8. In Spring 1926 he made a visit to Soviet Russia to give concerts in Leningrad and Moscow, during which he managed to arrange a private visit to the Hermitage in Leningrad, as well as to experience the changes the country had undergone since his earlier visits before the war and the revolution. In May 1927 came an important change in his career: he moved from Vienna where he had lived for many years to settle in Basel where he had been appointed conductor of the Basel Symphony Orchestra and also director of the Basel Conservatoire. It is at this point that the second volume of Weingartner’s Memoirs terminates, and the sequel in the third volume has yet to be published. From that time onwards till the outbreak of the Second World War the only continuous record available (apart from a few concert programmes) is the Paris weekly Le Ménestrel, which continues to mention, if only selectively, his principal musical activities in Europe. He was very active in Switzerland for several years to come, and introduced master classes in conducting at the Basel Conservatoire in 1933. Most significant, and most fully documented, was his return to Paris in 1931 after an absence of many years. 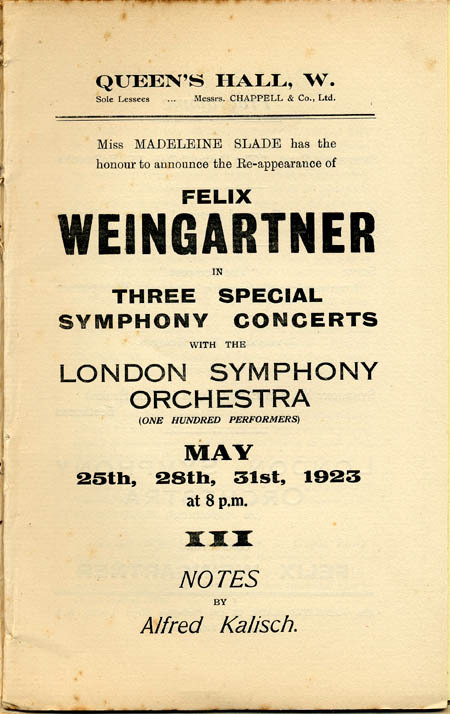 As with London eight years earlier, Weingartner was warmly welcomed and returned every year down to 1939: to judge from press reviews his concerts in Paris were invariably regarded as highlights in the musical calendar. 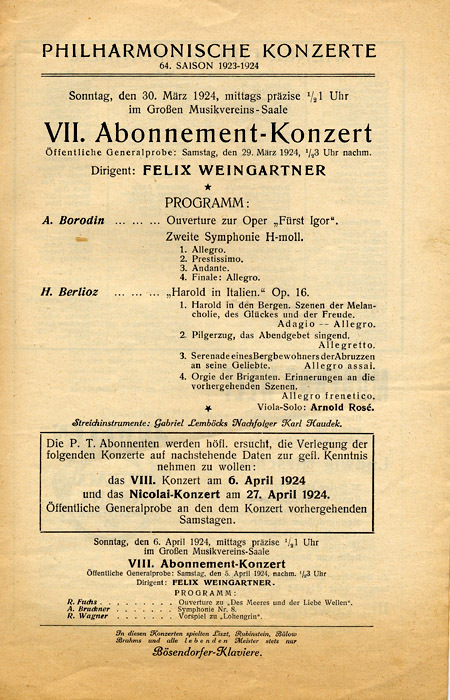 On the very eve of war, in February 1940, Weingartner made a visit to Portugal, a country he had not visited before, and gave two concerts in Lisbon with works from his regular repertoire, including a favourite of his, Berlioz’s Benvenuto Cellini overture. There is independent evidence of his visit to Palestine and Egypt in April 1940. The record then breaks off as the publication of Le Ménestrel came to a final end. At some point Weingartner returned to Switzerland, where he had acquired Swiss citizenship, and died on 7 May 1942 at Winterthur, four months after the first performance of his seventh and last symphony and two months after he gave his last concert. His papers are now deposited at the University Library in Basel. Weingartner’s repertoire was vast, from the old classics to contemporary music, though some composers he left aside; for example, though he was familiar with Russian composers of his time (LE II, pp. 109, 216, 423), he never mentions Stravinsky. Among the classics he developed early a particular admiration for Beethoven, and acquired in time a reputation as a Beethoven specialist. When in 1889 he started giving orchestral concerts with the Mannheim orchestra he was excited to have at last an opportunity to conduct the Beethoven symphonies as he wished (LE I, p. 349). Beethoven festivals or cycles of all the Beethoven symphonies became a regular feature of his concerts (cf. Ménestrel 22/8/1897 and numerous examples throughout his career). He was also the first conductor to record all the Beethoven symphonies. Among contemporary composers he had, as noted above, a special fondness for Wagner, Liszt and Brahms. Weingartner also thought of himself as a champion of the music of Berlioz and was regarded as such by contemporaries (for his own view of himself see LE I, p. 350; II, pp. 13-14, 82-3, 87, 120-1, 213-14, 218-19 and his articles on Berlioz translated on this site; for contemporary views see e.g. Ménestrel 31/10/1897; 6/3/1898; 3/3/1901; 9/3/1902; 15/11/1903; 9/4/1920). Though Weingartner was born while Berlioz was still alive, he came too late to have any chance of direct personal acquaintance with him (unlike with his idols Wagner, Liszt and Brahms). Nor does he seem to have developed subsequently any close connection with French musicians who had known Berlioz, such as Ernest Reyer and Camille Saint-Saëns. For comparison, it was as a result of a meeting with Théodore Ritter in May 1875 that Felix Mottl had his attention drawn to Berlioz, and was inspired to become a leading champion of the composer from the 1880s onwards. But Weingartner only started to develop contacts with French musicians when he began giving concerts in Paris from 1898 onwards; his first contact there was with Charles Lamoureux, a Wagner enthusiast who had met him in Germany (LE II, p. 88). It is noticeable that there is no mention in Weingartner’s Memoirs of the leading champion of Berlioz in France at the time, Édouard Colonne, though he did conduct the Colonne orchestra in Paris at a time when Colonne was still alive (in 1905). According to his own account, Weingartner came to Berlioz relatively late, and had to discover Berlioz for himself. His Memoirs give valuable information on how and when this developed. His teacher in Graz, Wilhelm Mayer, though himself critical of Berlioz, first stimulated his interest by relating his memories of Berlioz’s visit to Prague in 1846 and showing him the full score of the Symphonie fantastique on the occasion of a performance of the work, though Weingartner could not make any sense of it at the time (Akkorde p. 9). In the coming years he heard in the concert hall various pieces by Berlioz which aroused his curiosity (LE I, pp. 75, 150, 184). His meetings with Franz Liszt from 1882 onwards further contributed to his interest in Berlioz, particularly that in May 1885 in Karlsruhe where Liszt related at length his memories of Berlioz (LE I, pp. 234-5). But it should be added that for Weingartner Liszt was in the first instance the old and celebrated master who had shown interest and support for Weingartner, the young aspiring musician, rather than Liszt, the friend and former champion of Berlioz. On his side Weingartner continued to study Berlioz, but needed an opportunity to perform his music himself; this only came in 1889 when his appointment in Mannheim gave him a chance to start off a series of orchestral concerts, at which he was able to rehearse and perform the Symphonie fantastique: this was the breakthrough, and ‘from that day I knew that I had to work for Berlioz’ (LE I, p. 350). The evidence for Weingartner’s performances of Berlioz comes for the most part from concert programmes, a small number of which are reproduced below, and announcements of concerts and reviews in contemporary journals; a large selection from the Paris weekly Le Ménestrel is reproduced on a separate page. This constitutes of course only a minute though probably representative part of what exists but would be very time-consuming to piece together. It should be noted that Weingartner’s own Memoirs say overall relatively little about Berlioz (compared to what he says about e.g. Wagner and his music). For instance Weingartner mentions his participation in the centenary celebrations of Berlioz in Grenoble and La Côte Saint-André in August 1903 (LE II, pp. 120-1) and published separately a detailed account of his journey there, but he fails to mention that he also gave in that year a series of concerts of Berlioz’s music with the Kaim orchestra in various cities in Germany (see 1903), and also that he gave the first performance of the previously unpublished Prix de Rome cantata Cléopâtre in London (see Ménestrel under 1903). Weingartner’s Berlioz repertoire was more extensive than that of Hans von Bülow, but significantly more limited than that of his contemporaries Édouard Colonne in France and Felix Mottl in Germany. Weingartner’s silence on Colonne in his Memoirs was noted above. 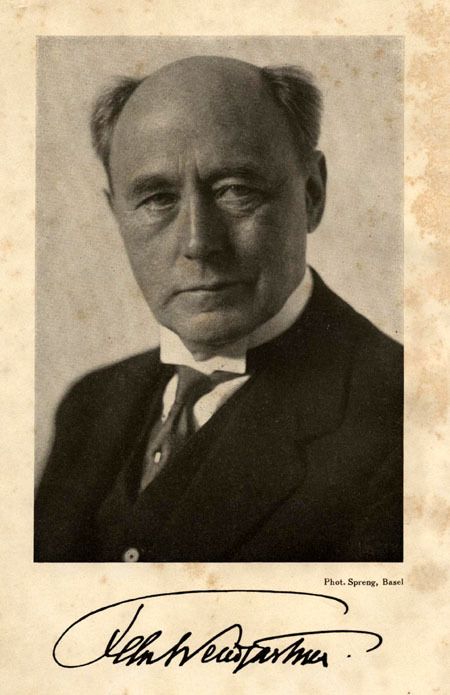 He does mention Felix Mottl several times, and mostly in very complimentary terms, though differed from him in his attitude to Wagner; he wrote a short obituary notice of Mottl in 1911 (Akkorde, pp. 119-22). He attended Mottl’s performance of Les Troyens in Karlsruhe in December 1890, and was full of praise for Mottl’s achievement (LE I, p. 363). But he does not bring out the role of Mottl as a champion of Berlioz over his career as a whole, which was more extensive than his own. In his Berlioz repertoire the Symphonie fantastique was by far the most favoured work: he performed it almost everywhere he went (1889, 1891, 1898, 1902, 1906, 1920, 1923, 1925, 1932, 1934). Harold en Italie was also performed with some frequency (1902, 1903, 1923, 1924, 1933), as were the purely orchestral excerpts of Roméo et Juliette, and more rarely the complete work (1893, 1899, 1903, 1904, 1923, 1930, 1934, 1938). Among shorter orchestral pieces his favourite was the overture to Benvenuto Cellini (1901, 1906, 1924, 1934, 1940; cf. Akkorde pp. 170-3), and also the Carnaval romain overture (1898, 1906, 1923, 1938). Other overtures received occasional performance: Le Corsaire (1897), Rob Roy (1901, 1903), but not seemingly Le Roi Lear (which offered competition to his own symphonic poem on the same subject; see below). Among larger works with voices he gave occasional performances (1905, 1912) of the Requiem (a work he had some reservations about; cf. LE I, p. 234-5), and more frequently La Damnation de Faust (1905, 1906, 1923, 1930, 1934, 1938). Among operas he had a clear preference for Benvenuto Cellini (as had Hans von Bülow before, whom he may have been emulating) and is known to have staged it on at least three occasions (Berlin in ca. 1897, Vienna in 1911, Paris in 1913; cf. Akkorde pp. 70-81). Incidentally, he seems to have been unaware that the Benvenuto Cellini he performed (the so-called Weimar version) was significantly different and shorter than Berlioz’s original version of 1838. As co-editor with Charles Malherbe of the Breitkopf & Härtel edition of Berlioz’s works, Weingartner can be assumed to have been familiar with Berlioz’s entire musical output (more will be said below on his part in this edition). The apparent omissions from his repertoire are striking. Among Berlioz’s major works he never seems to have performed L’Enfance du Christ (though it did not require large forces), the Te Deum, the Symphonie funèbre et triomphale, Tristia, the overtures to Les Francs-Juges and that to Béatrice et Bénédict, nor the complete opera itself. 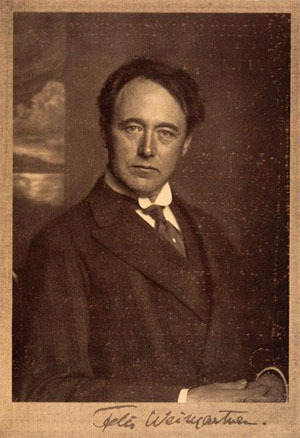 As for Les Troyens, he heard the work under Felix Mottl in Karlsruhe in 1890 and praised the performance, though was rather lukewarm about the work itself. He did toy with the idea of staging it in Berlin and later Vienna (Ménestrel 10/7/1892 and 23/11/1907) but does not seem to have ever carried this out. Weingartner was probably also familiar with all Berlioz’s published writings, at least those in book form, which were in any case all available in German translation (by Berlioz’s friend Richard Pohl). He does allude several times to Berlioz’s Grand Traité (Akkorde p. 164; LE II, p. 312), and did in fact publish an edition of the work (Leipzig, 1904), but surprisingly does not mention it in his Memoirs, though otherwise he regularly mentions his more important publications as well as his musical compositions. He cites from Berlioz’s essay on conducting in his own book on the subject, but that book has Wagner and Bülow as starting points, not Berlioz, and he does not seem to be aware of Berlioz’s importance in the history of conducting. He cites from Berlioz’s correspondence at least once (Akkorde pp. 169-70), though this is from a German publication, not from any of the publications in French which were available in his time. He knew the Mémoires, but does not refer to them anywhere in his own Memoirs; for instance, his account of his travels in Italy in 1890 does not show any awareness of Berlioz’s own travels there in 1831-2, which Berlioz recounted at great length in his own Mémoires (the literary figure he does mention in connection with his trip to Italy is Goethe). One may also wonder about any possible influence of Berlioz on his own music, but such an influence is rather hard to detect. Weingartner’s sound-world and style of orchestration, as shown in his seven symphonies and other orchestral works, is reminiscent of German music of the late nineteenth and early twentieth centuries, not of Berlioz. Berlioz took over the form of the classical symphony but treated it with great freedom and variety in his four symphonies, all very different from each other, and greatly extended the expressive range of the symphony and of orchestral music in general. Weingartner on his side kept throughout to the traditional four-movement structure of the symphony, and it was only in the last one that he introduced voices. Occasionally one may detect an echo, whether conscious or otherwise, of Berlioz’s music: the main theme of the third movement of Weingartner’s first symphony is obviously reminiscent of the Serenade (third movement) of Harold en Italie, though at a much faster tempo. It is striking that Weingartner should not have hesitated to venture into territory that Berlioz had already visited. Undeterred by Berlioz’s overture Le Roi Lear, he wrote his own symphonic poem König Lear on the same subject (in 1895, his first large-scale orchestral work; cf. LE II, pp. 90-1; Ménestrel 31/10/1897; 13/3/1898; 20/11/1904; 14/12/1923). The opening theme of Weingartner’s work is reminiscent of the start of the Berlioz overture (and also of Beethoven’s Coriolanus overture, in C minor like Weingartner’s), but is less distinctive and original. Weingartner also followed in Berlioz’s footsteps in writing his own orchestral arrangement of Weber’s piano piece, The Invitation to the Dance, though critical reaction at the time was consistently lukewarm (Ménestrel 10/5/1896; 19/2/1899; 24/11/1901; 1/12/1901; 2/12/1932), and as with König Lear it has failed to establish itself in the repertoire, unlike the two earlier works by Berlioz. Weingartner’s response to Berlioz in his own compositions invites comparison with that of two of his contemporaries, Richard Strauss and Gustav Mahler: both show clear and acknowledged influences from Berlioz, not only in their orchestration but in their approach to orchestral music and its expressive power. Yet both have at the same time a distinctive sound and style of their own, much more so than Weingartner. And both have earned a lasting place in the repertoire, something which Weingartner’s music has yet to achieve. As mentioned elsewhere, Weingartner’s exact role in the Breitkopf & Härtel edition of Berlioz’s works which he co-edited with Charles Malherbe is difficult to define. It has been widely assumed that much of the work was done by Charles Malherbe in Paris rather than Weingartner in Germany (or wherever he happened to be on tour at any given time). It is noticeable how little he says in his Memoirs about that edition apart from its initial launching, though work on it must have taken up a considerable amount of time (LE II, pp. 82-3, 120-1). Whatever his exact role in it, the edition reflects his general attitude to musical performance. He believed that conductors should be faithful to the works they were performing, but at the same time he was a practical musician who was prepared to adapt to the requirements of the moment. When asked once about his tempi in Beethoven symphonies, he made the disarming reply that he could not tell, as his tempi could vary from one day to the next (Ménestrel 14/5/1905). As seen above, he sanctioned cuts in some of Wagner’s operas, was prepared to do a new arrangement of Weber’s Invitation to the Dance, and suggest modest changes to the orchestration of Beethoven’s symphonies (cf. also Ménestrel 11/2/1938). That attitude is reflected in the Breitkopf edition, in its occasional changes to the original instruments used by Berlioz, against which Balakirev protested. One particular example of editorial interference with the Berlioz original is the rewriting of the dance passage in Part I of L’Enfance du Christ, where Berlioz writes the passage in a series of alternating 3/4 and 4/4 bars, which deliberately dislocate the regularity of the pulse. In Breitkopf this is needlessly changed into to a series of single 7/4 bars, a notation which Berlioz never uses anywhere. 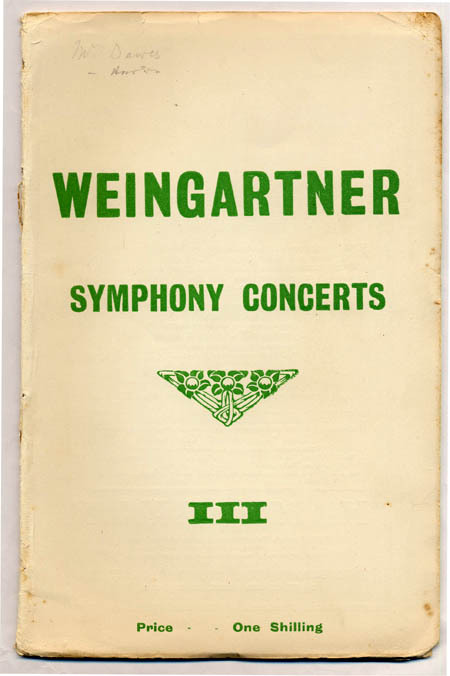 As a conductor of Berlioz, as of the music of other composers, Weingartner was generally highly rated, as may be gathered from the numerous reviews collected in the page of Ménestrel excerpts. They are all of course from one angle only, the French music critics who were based in Paris, but many different reviewers are involved and span a period of four decades from 1898 to 1939, which makes it possible to trace the evolution of Weingartner’s conducting style over a large part of his career. But one reaction from a knowledgeable critic is worth noting: according to Saint-Saëns, a close friend of Berlioz in his later years, Weingartner’s performance of the Requiem in Paris in 1912 took the Tuba mirum at a faster tempo than Berlioz indicated and thus spoiled the majesty of the passage. This may not be the only instance of Weingartner taking liberties in his performances of Berlioz. He himself confesses that while rehearsing Benvenuto Cellini in Berlin in (probably) 1897, he intended at first to cut the Allegro of Teresa’s aria in Act I believing it to be trivial, but was persuaded by the singer to reinstate it by taking it at a more measured speed. 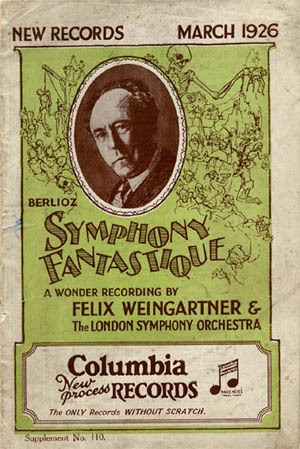 The evidence of his two recordings of Berlioz’s music, that of the Symphonie fantastique made in London in the autumn of 1925 with the London Symphony Orchestra, and that of the Marche troyenne made in Paris in July 1939 with the Paris Conservatoire Orchestra, gives a mixed picture. The Marche troyenne, a crisp and vital performance in much fresher and better-balanced sound than the older recording of the Fantastique, faithfully follows the score; it is hard to believe that Weingartner was 76 at the time it was made. The Symphonie fantastique has fine moments (such as the very beginning) but is more mixed, and treatment of tempo less predictable. In particular, the Marche au supplice is taken significantly faster than the metronome mark, and this changes the character of the piece (about minim = 82 instead of minim = 72). Most surprising is the start of the last movement, the Songe d’une Nuit du Sabbat, where the score’s marking of Larghetto crotchet = 63 is completely ignored and the passage taken absurdly fast. The rest of the movement is taken at speeds closer to the original markings, though with a tendency to rush in places. But it may be that the limitations of recording techniques at the time interfered with what Weingartner would have done in normal concert circumstances. In Weingartner’s promotion of Berlioz’s music there is a broad chronological division, before and after the first World War. Most of what Weingartner did for Berlioz came before 1914. After that date he continued to champion Berlioz to the end and perform his music (for example he included the Benventuo Cellini overture in one of his two concerts in Portugal in February 1940). But mentions of Berlioz in his Memoirs are fewer after 1914 than they were before. One may also regret that he did not make more recordings of Berlioz in the 1930s when recording techniques were developing (contrast his numerous Beethoven recordings of the 1930s). In his concerts he appears to have continued to draw on the same restricted repertoire as before, and did not seek to break new ground. Felix Weingartner, noted Swiss conductor, arrived here by airplane yesterday to conduct the Palestine Symphony Orchestra on its second Egyptian tour of the season. He immediately went into rehearsal with the orchestra. The five scheduled concerts, three in Cairo and two in Alexandria, have been sold out for ten days. Weingartner was due from Palestine Tuesday, but his plane was forced back from Lydda by a violent sand storm after nearing Port Said. Note. All the following excerpts, which form only a very small part of Weingartner’s autobiographical writings, are chosen to illustrate in the first instance Weingartner’s attitude to Berlioz and his music. See also the page Felix Weingartner: 5 articles on Berlioz. Akkorde p. 9: [In Graz, 1870s] An interesting event was the performance of the Symphonie fantastique by Berlioz. My teacher did not really like Berlioz, but had nevertheless come under his magic spell from the time when in Prague he had heard many works of his conducted by the composer himself [in 1846], and would not tire of telling me about it. He gave me the full score of the Symphonie fantastique on the occasion of its performance and remarked: « Listen to it carefully but do not follow any examples from it. » The impression I received was very mixed. It was only through performances that I conducted myself many years later that I learned to understand and love Berlioz. p. 75: [Around 1879] The greatest musical event of that time was a concert by the Vienna Philharmonic Orchestra under the direction of Hans Richter. The programme included the overture to Euryanthe, the Prelude and Love Death from Tristan, Berlioz’s Carnaval romain and Beethoven’s seventh symphony. The legendary conductor of the Nibelungen-Festival in Bayreuth was standing there in person in front of us. Out of the orchestra poured forth a flood of brilliant sound and tonal splendour. Who could have prophesied to me, the poor student who at the time was standing modestly in his corner and listening breathless, that one day I would be called upon to conduct myself this magnificent ensemble over a period of many years? p. 150: [February 1883] I still remember well a number of older operas, finely prepared under the baton of Artur Nikisch, who was now in sole command as musical director, and also a brilliant concert under Nikisch, who on this occasion gave for the first time a performance of Berlioz’s fantastic Queen Mab scherzo. He had to repeat it, so great was the success. p. 234-5: [End of May 1885 in Karlsruhe] At this music festival I heard for the first time the Dante symphony [by Liszt] and Berlioz’s great Requiem. As far as the musical offerings are concerned there is nothing else that I can recall, but what outshone everything else was a meeting with Liszt, the last time that I experienced the full force of his personality. […] (Weingartner goes on to describe his conversation with Liszt) « It is the same with translations from foreign languages », he then said. « I had a great deal of trouble with the translation of Benvenuto Cellini, although it was done by the excellent Cornelius. It is an easier job with texts in Latin, which remain the same in every country. » This led us to talk about the Requiem by Berlioz, and I expressed my amazement that after the shattering Dies irae Berlioz had used again the four brass orchestras in another two movements where they do not have any connection with the text. « You are right », Liszt said, « in the Lacrymosa in particular I would wish to do without them. The opportunity to use these four orchestras several times over was admittedly a temptation, but Berlioz should have resisted it. » He also related to us how he had a very serious argument with Berlioz on the subject of Wagner. « I do not go along with everything that Wagner has written », he said, « I find in the Nibelungen a great deal that is purely contrived and has really nothing more to do with music. But Berlioz was hostile to Wagner, and that I could not accept. At a later date we met again in Paris [October 1864]. We decided to have dinner together but on the understanding that we would not talk about Wagner. We then got on very well together. » He spoke enthusiastically about Berlioz’ symphonic works. The words flowed from his mouth freely and our own tongues were also loosened. It was late and time to go to the concert when we took leave of each other. « Farewell, my dear friends ! » he said with a depth of feeling in his voice which to this day rings in my heart. p. 350: [In Mannheim, in 1889] An altogether new world opened up to me, when in one of my first concerts I gave a performance of the Symphonie fantastique by Berlioz. Up to this time my attitude to Berlioz was one of wonder and curiosity; I was aware that significant things were going on there, but was not quite sure how to approach them. I now jumped in all at one go and saw myself surrounded with beings and shapes that were close to me and familiar. I welcomed and grasped this new world with inspired conviction, and from that day on I knew that I had to work for Berlioz. p. 363: The views held by Baron Stengel, who was my General Manager at the time, were expressed in an amusing fashion in a small incident which occurred on the occasion of a great artistic event which took place, not in Mannheim but in Karlsruhe. 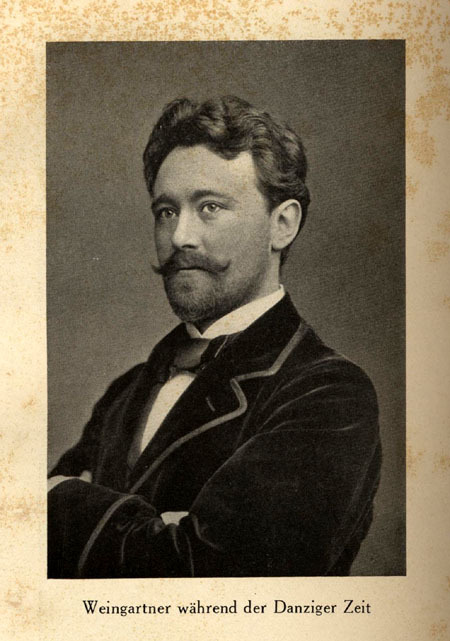 Felix Mottl had been zealously rehearsing there Berlioz’ Les Troyens over a period of months. The complete work was performed in Karlsruhe for the first time in two parts spread over two evenings [6-7 December 1890]; the second part had been given an unsatisfactory performance in Paris during the composer’s lifetime, while the first had not yet been heard at all. Many visitors had come to Karlsruhe for that purpose from abroad, including from France. The performances were outstanding. The dramatic impossibilities of the work could not be concealed, but many parts did work, especially in the second evening, thanks to its highly individual and altogether unconventional music. The performance covered up those sections that were weaker or old-fashioned. After the second evening we were sitting in a large gathering together with Mottl who was being congratulated for his magnificent achievement. Baron Stengel had also come along. « Tell me, Mr Director », he said aloud to Mottl with a clear side-glance, « how much time did you require to put together these two performances ? ». Mottl, who always loved to play practical jokes and had already guessed, replied with a completely straight face in his broad Austrian dialect: « Oh, eight days, I imagine ». « You see, eight days ! » Stengel moaned to me, and the roar of laughter which immediately greeted my superior’s remark prevented me from making any reply. 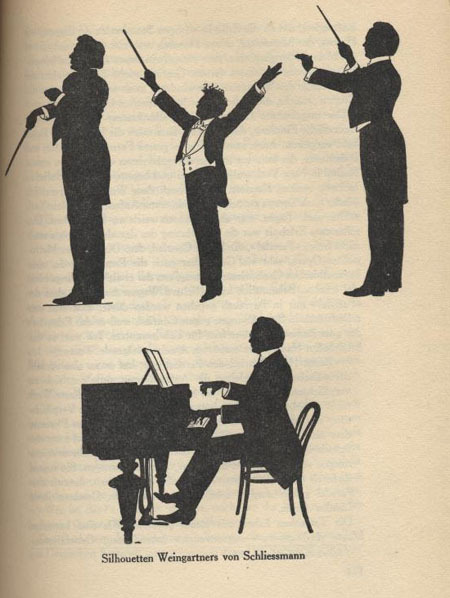 p. 13-14: [In Berlin, in 1891] In the meantime the conductor Kahl had stepped down from the direction of the symphonic concerts, and so the former division of work between Sucher and myself now came into operation. My plan to perform the Symphonie fantastique met with general resistance. Sucher himself was against, and finally made me the friendly but ironical promise to be at the concert and applaud vigorously in case I was greeted with hisses. In the rehearsals for symphonic music it was even clearer than at the opera that the orchestra was not up to scratch. But as at that time there was no limit on the number and duration of rehearsals, I was able to secure impeccable performances, not only of the Berlioz symphony but also of the Eroica and the Hebrides overture, and this at my first concert in Berlin. The success was so exceptional that the interest in the symphony evening which had completely collapsed began to revive. These evenings were a private institution in the hands of the royal orchestra, which made its hall available to it nine times a year. The proceeds were assigned to the pension fund for widows and orphans. But as the receipts were truly miserable, the ministry of the royal household had given serious consideration to the plan of terminating the concerts or handing them over completely to the care of the Superintendent’s Office. But the increased attendance which set in with my arrival and grew quickly caused this plan to disappear again. The great impression made by the Symphonie fantastique caused me to suggest to Count Hochberg to introduce also newer works for performance at the Opera. My heart was particularly set on Benvenuto Cellini [by Berlioz] and Der Barbier von Bagdad [by Peter Cornelius]. I also recommended Samson et Dalila by Saint-Saëns most warmly. But here my love was not reciprocated. In Hochberg’s view Berlioz’ music was terrible, Der Barbier von Bagdad was boring stuff, and the emperor would never allow a performance of Samson et Dalila. It was only later that I realised that at the royal opera the practice was to hide promptly behind what was claimed to be the highest authority whenever one did something silly or even worse. p. 62: [Spring 1896, with the Berlin Philharmonic in Vienna] As opening piece I had put Brahms’ second symphony on the programme, a work for which I already felt great fondness, although otherwise I refused obstinately to have anything to do with many of his works. I still persisted in seeing in Brahms the composer who was destined to topple Wagner. […] Brahms gave me a very friendly reception, but he still seemed to nurse a grudge against me, or possibly he wanted to try me out. As the conversation moved on to the programme for the evening, which contained Berlioz’ Carnaval romain following his symphony, he said suddenly with a note of irritation in his voice: « The first piece is obviously as good as useless, it is only with your Berlioz that people will wake up. » I felt hurt, but kept my composure and replied very calmly: « The performance will in any case treat Brahms and Berlioz with equal care. » This answer seemed to please him, as he became friendly once more and offered me, as though wanting to signal a quiet apology, a huge cigar wrapped in silver paper, which I had to light immediately, though I was hardly able to smoke even half of it. p. 82-3: [Late May 1897] The piece [Weingartner’s tone poem Das Gefilde der Seligen] was performed at the music festival of the Society of German Music in Mannheim, where in the meantime Reznicek was working as principal conductor at my suggestion. It was also published by Breitkopf and Härtel, with whom I now concluded a general agreement about the publication of my works. At this music festival the ground was laid for an important undertaking. Breitkopf and I took the decision to publish a complete edition of all the works of Hector Berlioz, which were only available in the first French editions and which in some cases were still unpublished. The keeper of the archives of the Paris Opéra, Charles Malherbe was invited as collaborator and agreed. The work could thus start immediately. p. 87: [See more fully Akkorde pp. 70-81] In Berlin after pressing hard for a long time I experienced the joy of being able to perform Berlioz’ Benvenuto Cellini. I was also able to secure the invitation of the outstanding violinist Carl Halir from Weimar to Berlin. Cellini had an excellent cast in Kraus, Bulß, Mödlinger and Emilie Herzog; Tetzlaff, the head of productions, was so much out of his depth with the work that they were compelled to listen to my advice, even as regards the staging. Otherwise, apart from a few privileges which my contract guaranteed to me, and in spite of having given up at the wish of the manager Count Hochberg several outside engagements so as to concentrate more on the opera, I remained a mere accessory. I was not allowed to have any influence over the planning of the programmes. Changes in the casting of operas were notified to me so late that I was not in a position to rehearse with the new singers. The quality of my performances sank to a lower level both because of that and because of my constantly increasing disgust at working under such conditions. The state of my nerves had become so bad that I was only able to get through to the end of many a performance with the greatest of effort. p. 88: [In 1897] I had committed myself to go to Paris in March 1898. On the occasion of a concert which I gave in Leipzig with the Berlin Royal Orchestra I had met Charles Lamoureux, who was conducting there the Winderstein Orchestra. This short and valiant man, who had courageously taken up the cause of German music in Paris at a time when it was still dangerous to do so, immediately developed friendly relations with me and invited me to come and conduct his orchestra. That a conductor at the royal court of Prussia should be invited to Paris was something that still attracted attention at the time. p. 90-1: [After a stay in Sicily from November 1897 to January 1898] Full of the spirit of Greece, and intoxicated with the significance of what had happened to me, I returned to Germany, stayed for a while in Mannheim and then travelled on to Paris, where Lamoureux and his son-in-law Camille Chevillard welcomed me at the railway station. The first rehearsal took place the following morning at the Cirque d’Été, the only venue that was available to Lamoureux and which he characterised with the sigh « on sent les chevaux ». Lamoureux managed his organisation according to his own ideas. He was the absolute master of his hand-picked orchestra. One could work as one wished and for as long as was necessary. After I had become accustomed to the peculiar sound of the French brass instruments, I felt comfortably at home. 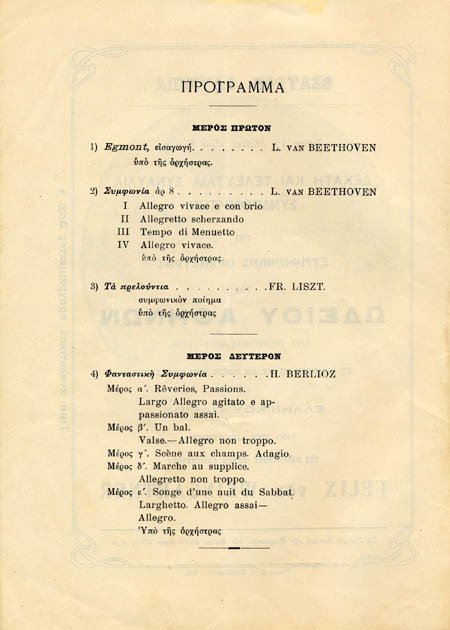 Apart from Berlioz’ Symphonie fantastique I only conducted German music, including my King Lear, which Lamoureux had heard in Leipzig and had himself included in the programme [6 March 1898]. The public gave me a very warm welcome, as did the majority of newspapers. I had the joy of greeting Marie Jaëll the noted pianist and friend of Liszt, who sent me flowers with a card saying « Enthousiaste de votre direction et de votre œuvre ». Lamoureux and his son-in-law gave me the friendliest of welcomes. I made the acquaintance of Madame Chevillard, an intelligent woman, who spoke and wrote very good German, and was a convinced admirer of German art and culture. The celebrated Padilla couple of artists invited me to their house. Artôt-Padilla, who later became a singer at the Berlin Court Opera, was at the time an enchanting young lady in the first bloom of youth. I was entertained by many others besides these: there was no hint anywhere of any hostility to Germany. p. 120-1: At the beginning of the year 1900 the first volume of the great Berlioz-Edition appeared, and this was followed by further volumes later. Charles Malherbe was not only a first-rate collaborator, but I also gained in him a dear friend. This excellent man died shortly before the beginning of the World War [in October 1911]. He was spared from experiencing the revolting expressions of hate which unfortunately were directed not only at the way the German people were being led, but against the people itself. Although our edition of Berlioz was still not allowed in France, as in 1900 the works of Berlioz, though now in the public domain in Germany, were not so in France according to French law, my commitment to the great French musical master was so well known and appreciated there, that I was invited to the celebrations of his hundredth birthday in Grenoble as representative of Germany [15-17 August 1903]. At the festival concert I conducted the Symphonie fantastique and at the unveiling of Berlioz’ monument I deposited at its foot a crown with the colours of Germany. That same evening I travelled with the Mayor of La Côte Saint-André, M. Meyer, to the birthplace of the master. It was my first journey by motor car. On entering the town we were surrounded by an excited crowd, and “la couronne d’Allemagne” was brought to the small museum in the house where Berlioz was born, to the sounds of the Marseillaise, where I deposited it in person*. The surviving descendants of Berlioz who lived in Grenoble, the Chapot family, had a cast made of a medallion which was made when Berlioz stayed in Rome as young winner of the prize of the Paris Conservatoire. They had a dedication inscribed around its rim and sent it to me in Munich. p. 218-19: Benvenuto Cellini was staged near the end of February, and was brilliantly produced by Wymétal [25 February 1911]. That brought to an end my worries about the Court Opera. In that year we had hired our little cottage in St. Sulpice [in Switzerland] for four months, and given instructions to have it furnished more comfortably than the year before [we = Weingartner and Lucille Marcel, who was to become his third wife]. But before departing there were still many journeys to be completed. Gabriel Astruc, who ran an extensive agency in Boulevard des Italiens, had now taken over the management of my concerts in Paris. He organised a Beethoven-Berlioz Festival with the Colonne orchestra [see the Note below]. We gave La Damnation de Faust and Beeethoven’s Ninth Symphony at the Opéra with choruses from Holland. It was on the occasion of this performance of the Ninth Symphony, and not first after the war, that German was sung for the first time at the « Institut de France ». Lucille [Marcel] gave an evening of songs with compositions of mine, and it was also attended by Henry Russell, the director of the Boston Opera. p. 228: [April 1912] In this year Charles Astruc arranged for me three monumental choral performances with English choirs in the Trocadéro. He was already busy with the construction of his Théâtre des Champs Elysées which he intended to open the following year with a performance of Benvenuto Cellini under my direction. p. 287: [In Rio de Janeiro in Brazil, from Weingartner’s diary for his trip to South America from June to November 1920]. 27 July. […] Lucille sings also two beautiful songs by Berlioz, L’Absence and L’Ile inconnue. All are delighted with their beauty, but nobody knew these songs. p. 312: [Another entry from the same diary, Buenos Aires, 16 September 1920; performance of an arrangement for wind band of Weingartner’s Lustige Ouvertüre] A family of twelve saxophones from the sopranino to the contrabass makes a particularly beautiful sound. I have never heard these instruments together in such large numbers. Berlioz has already drawn attention to them specifically [in his Treatise on Orchestration] [In a footnote: At that time they had not yet been used for jazz-music]. p. 377: [In 1923] The most gratifying event of that spring was my return to London. Miss Slade had arranged the concerts with all the graciousness which she herself possesses. The public gave me a magnificent reception and the press greeted me with the greatest warmth. Musicians, musical associations and social gatherings all vied with each other in demonstrating their friendliness to me and to my wife [Roxo Betty Calisch, whom Weingartner had married the previous year]. The London Symphony Orchestra invited me for the following season, an invitation which to this day has been repeated year after year. With the Columbia Gramophone Company and its enterprising director M. Brooks, I signed a contract which has continued for years and is still active. My records are already available in large numbers. All the illustrations below are from books, programmes and other items in our own collection. Weingartner was conductor at the Danzig opera house from 1885 to 1887. Many of the portraits below are reproduced from our copy of LE; this one is from LE I, facing p. 289. This is the only portrait in LE that shows Weingartner wearing a moustache and a beard, which Weingartner otherwise avoided. Weingartner himself gives the explanation: a young conductor at the time, he had difficulty asserting his authority, and was advised by a friend that growing a beard would make him look older and more impressive! (LE I, p. 240). Weingartner was conductor at the Mannheim opera house from 1889 to 1891. This portrait is from LE I facing p. 353. Weingartner married no less than five times. As he admits himself in his autobiography, he had for many years difficulty in relating to women, and attributed this in part to the protectiveness of his mother. His first two marriages, between 1891 and 1911, ended in divorce; he says very little about these, gives no dates, and does not even name the women concerned, though he does mention that he had a son named Alfred from the first marriage; Alfred had himself a son (Peter Klaus), but died later, in 1922, aged 30, which places his birth in 1892 and Weingartner’s first marriage in 1891 (on all this see LE II, pp. 10-12, 250; the portraits of son and grandson are reproduced in LE II, facing p. 48). About his second marriage Weingartner says nothing. On 31 December 1908 Weingartner met by chance the American born singer Lucille Marcel who had come to Vienna to audition for performances of Richard Strauss’ opera Elektra. Relations developed very quickly, and Weingartner devotes a whole chapter of his Memoirs to Lucille (LE II, pp. 182-209), the only chapter of the work that is named after a person (apart from the chapter on Franz Liszt, LE I, pp. 158-99). They were married in New York on 29 January 1913 (the picture above was taken on that occasion and is reproduced from LE II, facing p. 240). 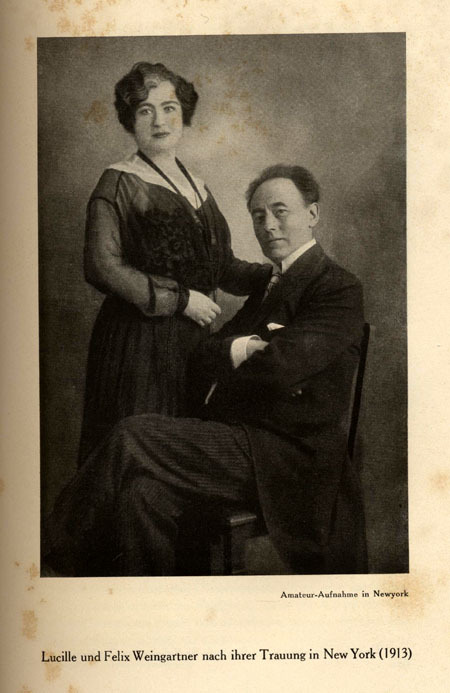 Lucille and Felix Weingartner became extremely close (at one point each considered converting to the other’s religion — he was catholic and she protestant [LE II, pp. 205, 330-1]). Her early death on 22 June 1921 was a heavy blow to Weingartner. He remarried the following year to the actress Roxo Betty Calisch. 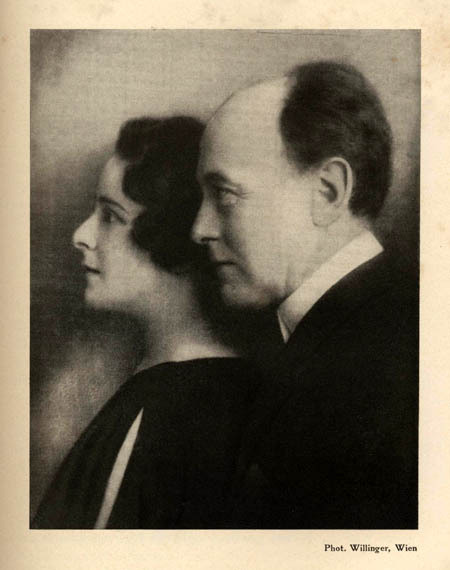 Weingartner remarried in 1922, within a year of the death of his third wife Lucille Marcel to whom he had been very devoted. 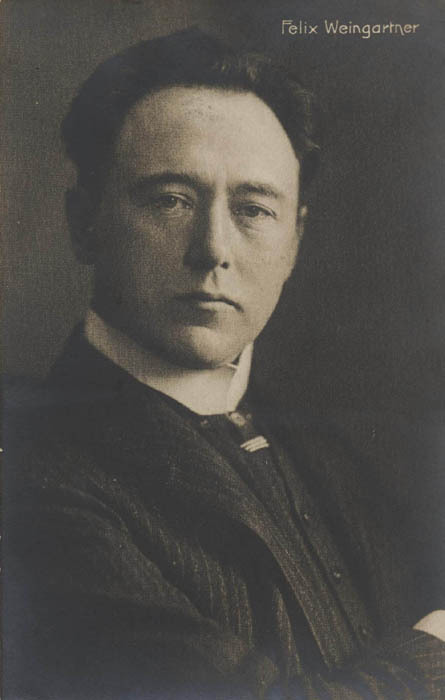 His fourth wife, Roxo Betty Calisch (or Kalisch), an actress from a Dutch family, was born in the late 1880s and was more than 20 years younger than himself (it is not clear whether she was related to the London-born music critic and writer Alfred Kalisch who is mentioned below). The presentation of their relationship in Weingartner’s Memoirs is strikingly different from that of Lucille Marcel: whereas Weingartner constantly refers to her simply as ‘Lucille’, he never refers to his fourth wife as ‘Roxo’ or ‘Betty’, but always as ‘my wife’. The account of their meeting and marriage is brief and businesslike (LE II, pp. 351-3), and their relationship is presented primarily in practical terms (she was evidently an efficient house-keeper, as well as an actress by profession). The presentation of their married life in LE II is deceptively positive and gives no hint of underlying problems, but in due course these came to the surface. The couple eventually divorced, and Weingartner remarried a fifth time in 1931, this time to one of his conducting students, Carmen Studer (1907-1987), who developed a conducting career of her own (see Ménestrel 26/5/1933; 15/12/1933; 31/8/1934; 7/12/1934; 23/12/1938; 19/5/1939). The account of Weingartner’s last marriage is contained in the third volume of his Memoirs, but that is as yet unpublished. This portrait is reproduced from LE II, facing p. 384. This picture is reproduced from LE II, facing p. 353. 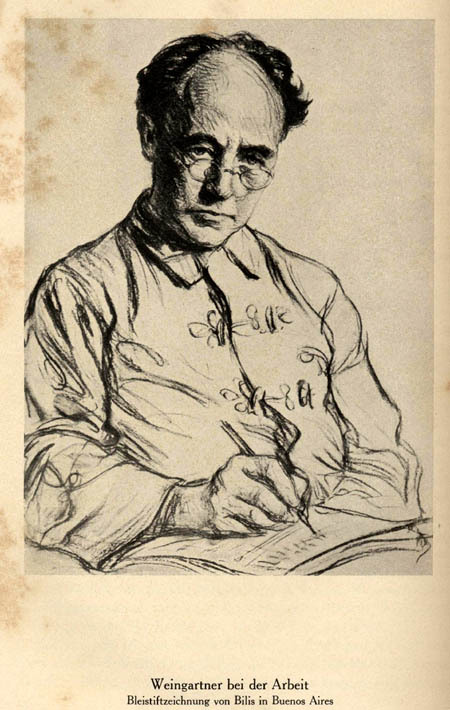 The drawing was made in Buenos Aires by the resident French artist Bilis during Weingartner’s second trip to South America in 1922, and shows Weingartner at work writing a book on Bô Yin Râ — the pseudonym of the painter and writer Josef Anton Schneiderfranken whose work he had become attracted to (LE II, pp. 329-30, 347-8, 358-9). This portrait is from LE II facing the title page. From his first trip to Italy in 1890 Weingartner was attracted to the country which he visited frequently thereafter; he loved its Mediterranean climate, as well as its art treasures and ancient monuments. 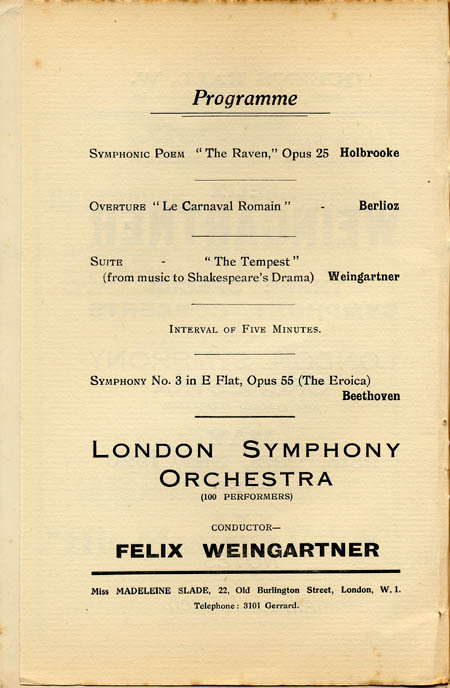 The programme for this particular concert comprised three orchestral movements (II-IV) from Berlioz, Roméo et Juliette; Weingartner’s Symphony no. 2; and Liszt’s symphonic poem Mazeppa (cf. Ménestrel 15/2/1903). 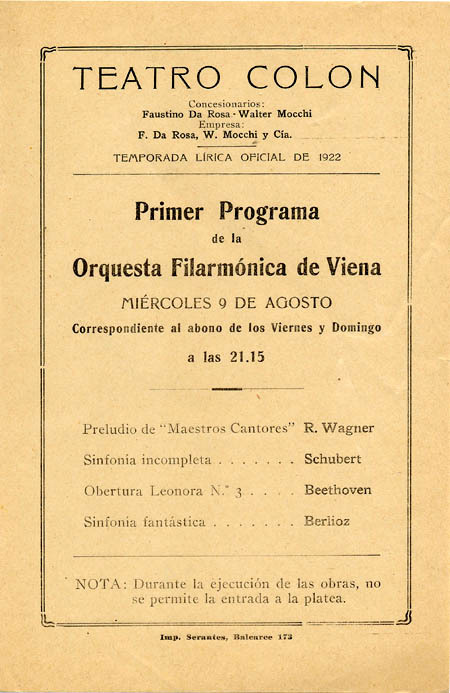 This concert formed part of the second trip to South America made by Weingartner in 1922, during which he took the Vienna Philharmonic Orchestra on tour, an orchestra he had been associated with since 1909. This concert is specifically mentioned in Weingartner’s own Memoirs (see LE II p. 362). The programme of the concert consists of works that formed part of his standard concert repertoire wherever he went. Weingartner was a frequent visitor to London from the time of his first visit there in 1898; the outbreak of the first World War in 1914 interrupted his visits for several years, but they resumed in 1923 after the war (much earlier than they did with France), and became frequent thereafter up to the outbreak of the second World War in 1940. Weingartner mentions the return to London in 1923 in his Memoirs (LE II, 373-4, 377-8). As can be seen on the second image above, the programme notes for these concerts were written by Alfred Kalisch (1863-1933), a music critic based in London who was a champion of the music of Richard Strauss (he translated the libretti of several of his operas). What relationship if any existed between Alfred Kalisch and Roxo Betty Calisch (or Kalisch), Weingartner’s fourth wife whom he had married the previous year, appears to be unknown (father and daughter?). At any rate Roxo had relatives in London: Weingartner states that on the occasion of his visit he met Roxo’s sister, and had previously met her parents (LE II, p. 378). 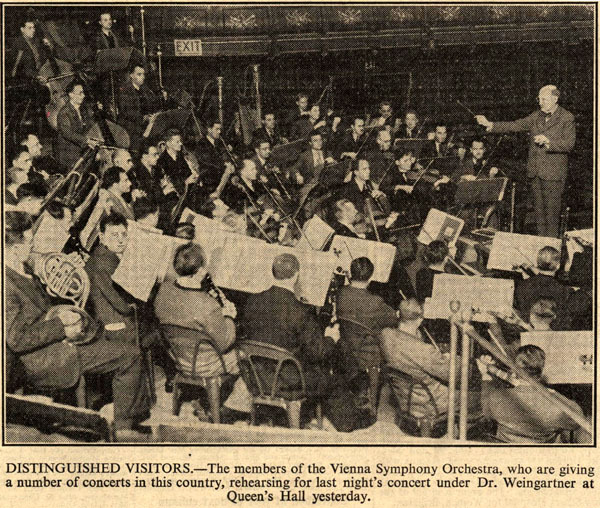 Weingartner’s close relationship with the Vienna Philharmonic Orchestra started as far back as 1909 and endured in practice till the 1930s, when many of his recordings of Beethoven were made with that orchestra. This is an unusual concert programme, written in a mixture of Roman and Greek letters. 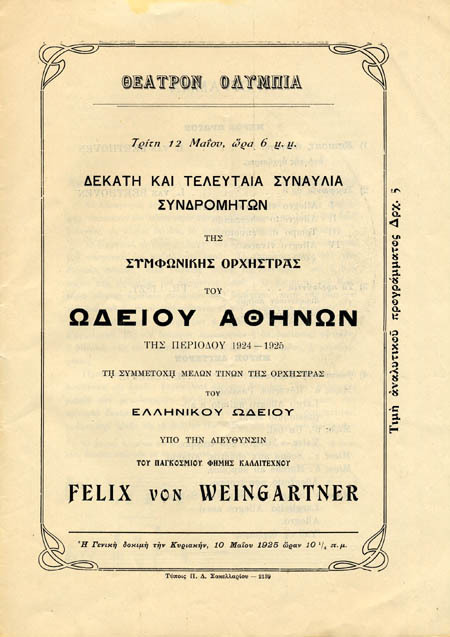 It relates to the first of four concerts given by Weingartner in May 1925 during a trip to Greece (LE II, pp. 406-7, 408-13). He travelled there by sea from Trieste to Athens around the Peloponnese, though returned by train. 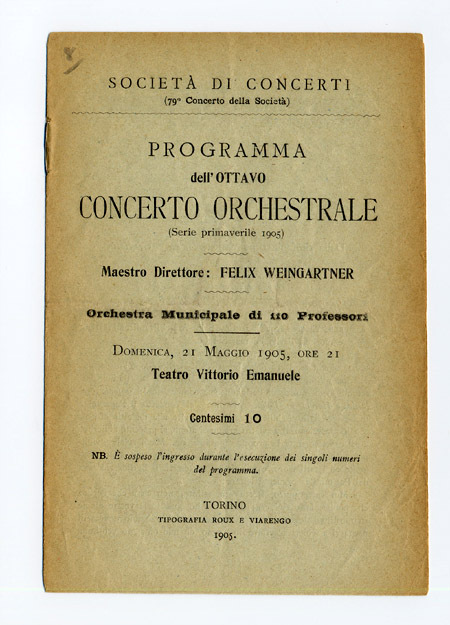 The programme of the concert included familiar items from Weingartner’s repertoire: Beethoven’s Egmont overture and fourth symphony, Liszt’s Les Préludes, and Berlioz’s Symphonie fantastique. He took advantage of the trip to indulge his passion for sightseeing and ancient monuments, though was hampered by unexpectedly poor weather, and on two occasions by a swarm of locusts... Inspired by the ruins of Athens and its history he dreamt of the city as a possible cultural centre for the whole world, a kind of Bayreuth that would not be limited to a single individual, and wrote a letter on the subject in French which was published in the local Messager d’Athènes on 20 July 1925 (cited in LE II, p. 412). Weingartner gave a number of performances of La Damnation de Faust during his career (for other examples see 1906, 1923, 1934, 1938). 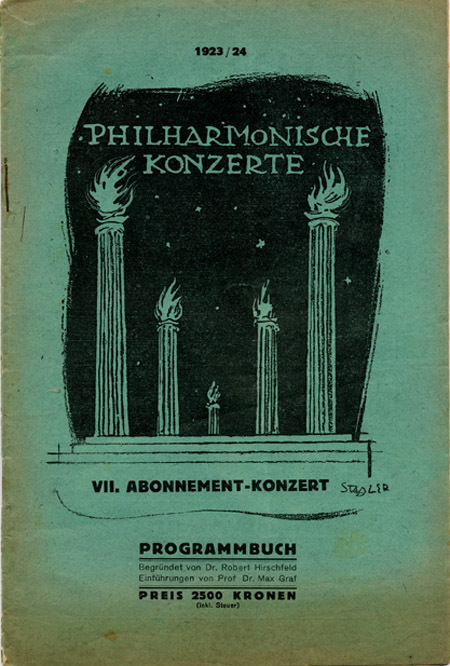 It will be noted that this programme and the following one are printed in Gothic script, not Roman as was the case in the Vienna programme of 1924 above. 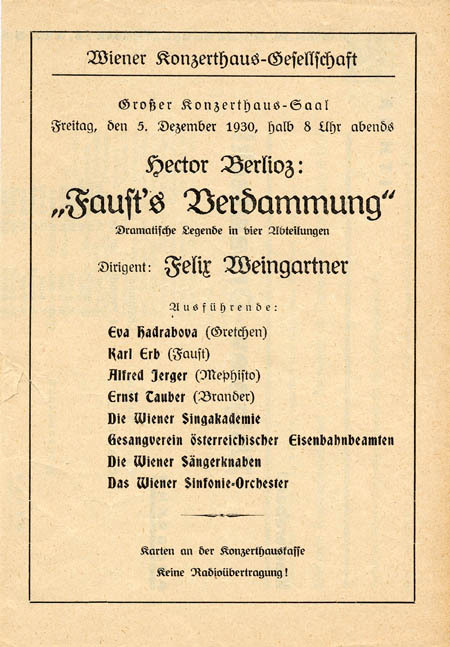 Weingartner commented on the originality of La Damnation de Faust in his account of his participation at the Grenoble centenary festival in 1903 (Akkorde p. 225). Beethoven’s only opera Fidelio held a special place in Weingartner’s affections. He relates in his Memoirs how as a young boy he had been anxious to see the work performed on stage, but his mother only granted his wish on condition that he take swimming lessons! Weingartner remembered the occasion of the performance vividly (LE I, pp. 37-40). This was in 1873 when he was ten years old. A few years later, in 1878, he received the full score of the work as a Christmas present, the first in his collection of opera scores, and he studied it avidly (LE I, p. 66). In autumn 1888, in his second season as assistant conductor at the Hamburg opera, he was disappointed not to be allowed to conduct a performance of Fidelio (LE I, p. 322). Years later, in 1907, when he was appointed as director of the Vienna Court Opera starting in January 1908 (Ménestrel 24/8/1907, 23/11/1907), he had at last a chance to direct the work himself as the opening production of his tenure (LE II, pp. 152, 157-8). 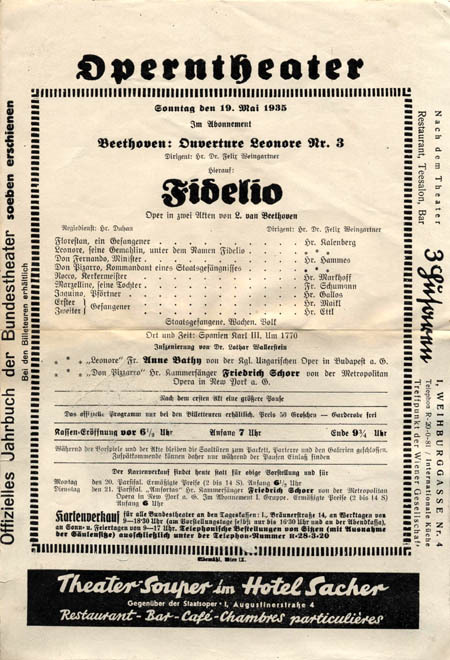 Seventeen years later history repeated itself: when for a brief period in 1935 and 1936 Weingartner found himself again in charge of the Vienna Opera, he made a point of staging again Fidelio, as illustrated by the programme above. On Weingartner’s Lebens Erinnerungen (Memoirs) see above. 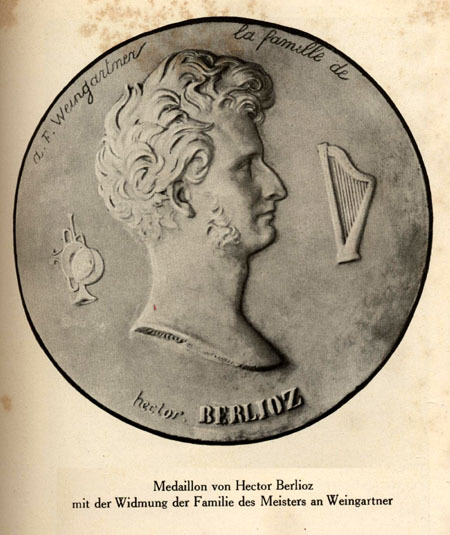 This is a copy of the medallion that was given to Berlioz as winner of the Prix de Rome in 1830. The copy was made specifically for Weingartner in 1903 by the descendents of Berlioz (the Chapot family) living in Grenoble, with a dedication to Weingartner added around the rim of the medallion; see LE II p. 121. The image is reproduced from LE II facing p. 112. This is reproducted from LE II p. 133. From a newspaper cutting of 1936. These concerts are referred to in Le Ménestrel 30/10/1936 p. 302 and 6/11/1936 p. 308, though the exact date of the concert is not clear. During his visit to London in May 1923, the first since before the 1914-1918 World War, Weingartner made a long-term contract with the Columbia Gramophone Company (see LE II. p. 377). 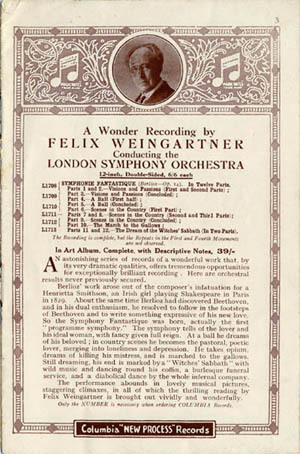 One sequel of this contract was the first ever recording of the Symphonie fantastique, a staple item in Weingartner’s concert repertoire. The recording sessions for this took place at Petty France in London on 28 & 29 October and 1 November 1925, and the record set (in 12 parts on 12-inch double-sided 78rpm records) was released in March 1926. The only other recording of music by Berlioz made by Weingartner was that of the Marche troyenne, made in Paris with the Paris Conservatoire Orchestra on 12 July 1939. Page Berlioz: Pioneers and Champions created on 15 March 2012; this page created on 1st April 2019. © Monir Tayeb and Michel Austin. All rights reserved.